After years of waiting, Po Boy Jim on H Street (709 H Street, NE) finally opened its doors this week and based upon our initial experience it was worth the wait (you can read our first preview post from September, 2012 here). The restaurant is a family business that has several family members working throughout the restaurant. The staff was very friendly and seemed to take pride in the restaurant and its food. The first day of service was this Thursday, and after they have a couple of days of operations under their belts, the owners plan on having it open from lunch through dinner and late night. It will open at 11am for lunch and stay open until 3am on weeknights (earlier during the week). 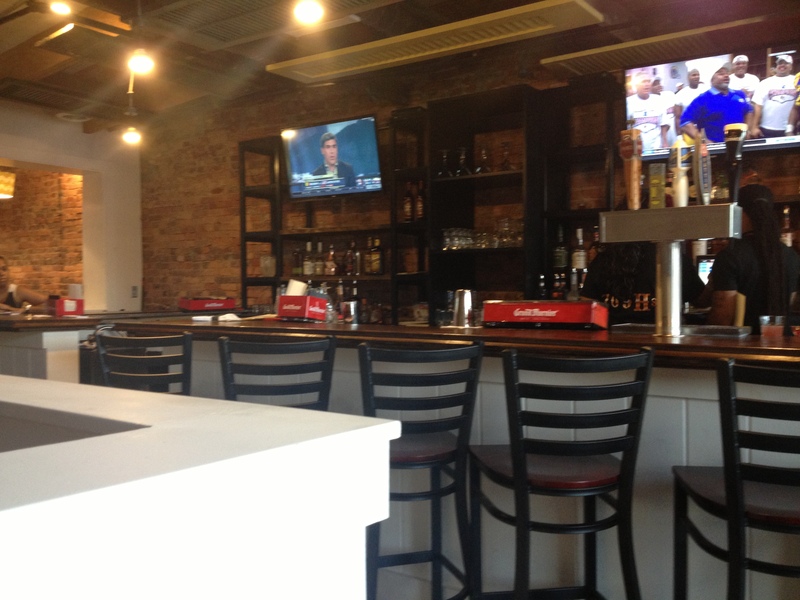 The restaurant offers full dining service as well as takeout and bar service. The food is cajun inspired but has different influences from around the world throughout its menu (which you can view here). 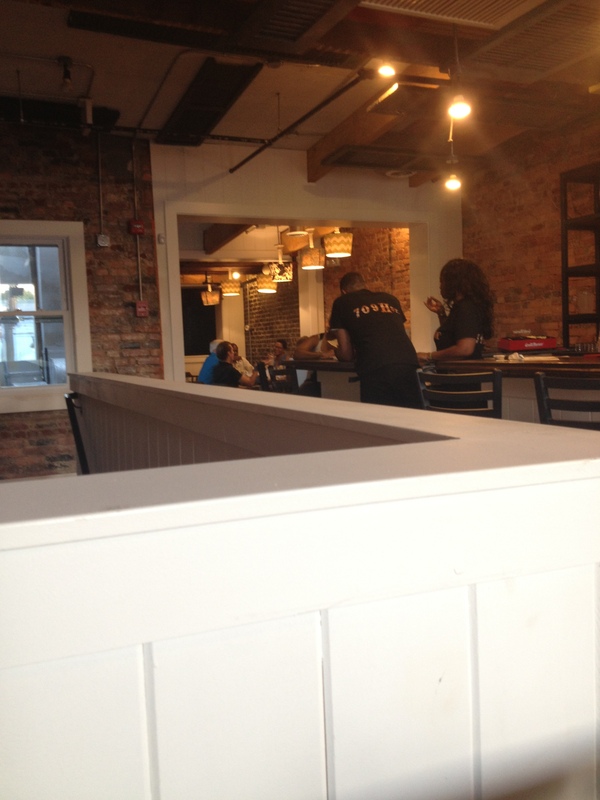 Po Boy Jim’s interior was completely renovated and the space is quite large. 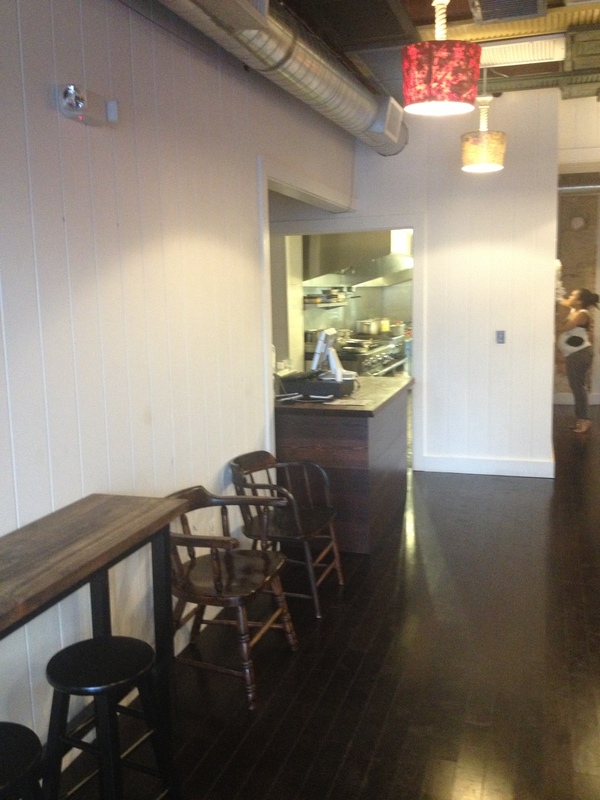 The downstairs area has several tables, a somewhat open kitchen, and a place where you can wait for takeout. There is a fairly large patio with several picnic tables and a large wall mural featuring the forthcoming (we hope) H Street streetcar. 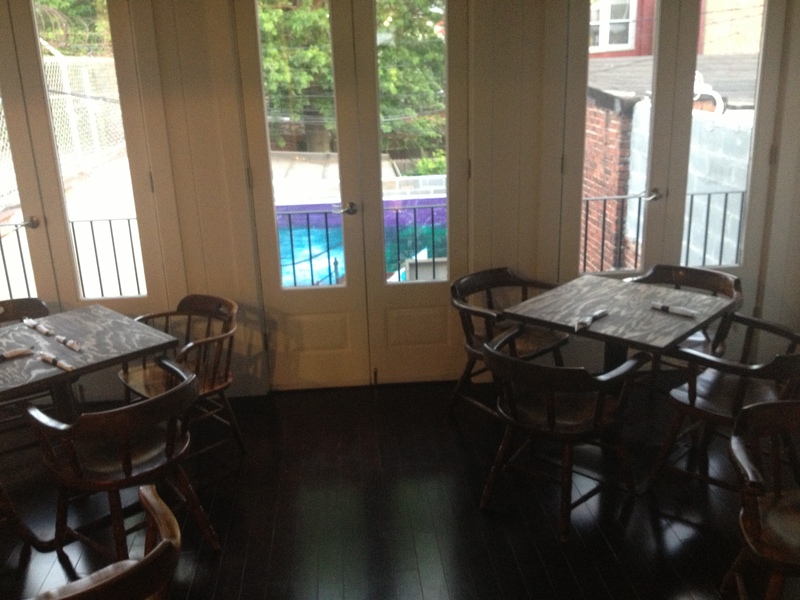 The upstairs has a large bar as well as tables that overlook H Street down below. 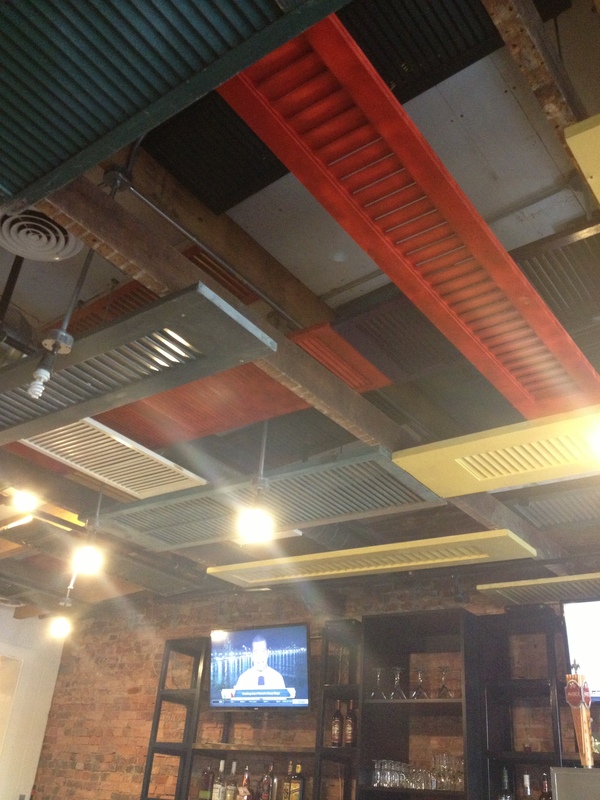 The ceiling has been decorated with large and multicolored window shutters to create a very interesting vibe. When you walk past the bar on the upper level, there are two separate additional dining areas towards the back of the restaurant. The second of the two back dining areas has glass doors with a railing that overlook the patio that will be opened once the patio is complete (it is still under construction) whenever the weather is nice. On the night that we were in there, jazz was being played throughout the restaurant to give it an authentic New Orleans feel. The menu has several starters and then three different categories of po boys: traditional, international, and specialty. 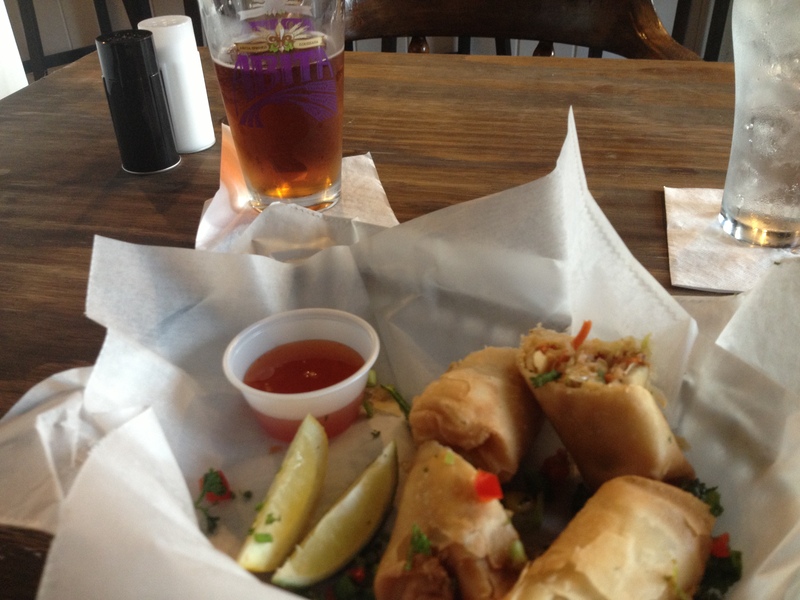 We started with the crawfish spring rolls. Overall they were good; however, we were a little disappointed that there was not more crawfish in the rolls. The crisply fried spring rolls had shredded vegetables, corn, and shredded crawfish meat in them, but the crawfish definitely took a backseat to the first two ingredients. There was a nice sweetish chili sauce to dip them in. 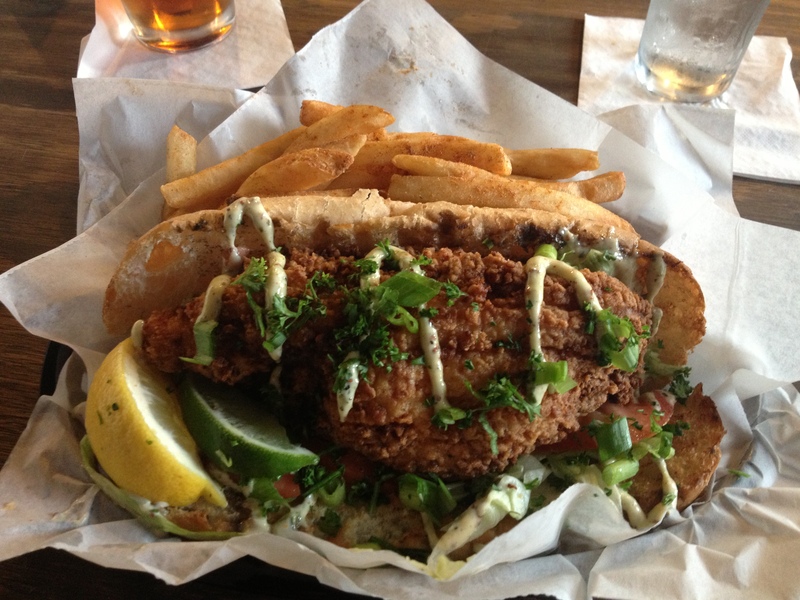 For our first visit, we wanted to test how the kitchen would do a standard fried catfish po boy, figuring that would be a good initial test of the kitchen’s skills. We were impressed. First the bread: thick and nicely toasted, such that it didn’t overpower the sandwich but was hefty enough to not immediately fall apart. The catfish was fried well so that it wasn’t overly greasy from hanging out in the fryer for too long. And finally the remoulade sauce: created with just the right amount of spice so that it complemented the fried catfish and completed the dish. We look forward to trying additional, more exotic po boys in the future, but we were impressed by our initial taste. Po Boy Jim is already a great addition to the neighborhood. In addition to having good food and a good vibe, it is also located in the middle of H Street–an area that has struggled to attract new development. Po Boy Jim and others that are scheduled to open in the coming months and years in the middle section of H Street will be key to linking the east and the west sides of the H Street corridor. We hope that the rest of the businesses that open in the middle section will be as strong as Po Boy Jim appears to be already.